By using AmazonSmile for your online shopping, Amazon will donate .5% of the price of your purchases to the New-York Historical Society. Please take a moment to sign up and select New-York Historical as your charity of choice. All of your future purchases through AmazonSmile will also make a difference to N-YHS. To change your charity to the New-York Historical Society, sign in to your account and go to settings. Under settings you will find Change Your Charity. Click on this link and type New-York Historical Society into the Charity finder. 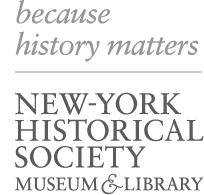 Once New-York Historical Society appears, click “select.” Your charity will have been changed and your purchases will now benefit N-YHS. Your generosity will allow us to continue Making History Matter with our heralded exhibitions, public programs, and educational efforts. We deeply appreciate your support.